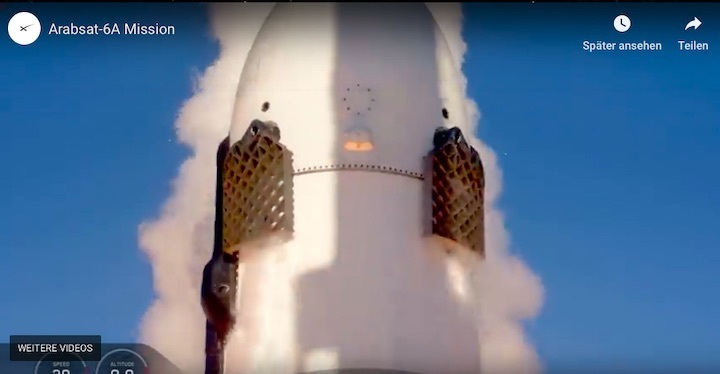 For a company that rarely reveals anything without explicit intent, a February 28th video posted by SpaceX during the lead-up to Crew Dragon’s launch debut featured a surprise cameo: two Block 5 side boosters meant to support Falcon Heavy’s commercial debut and second launch ever. 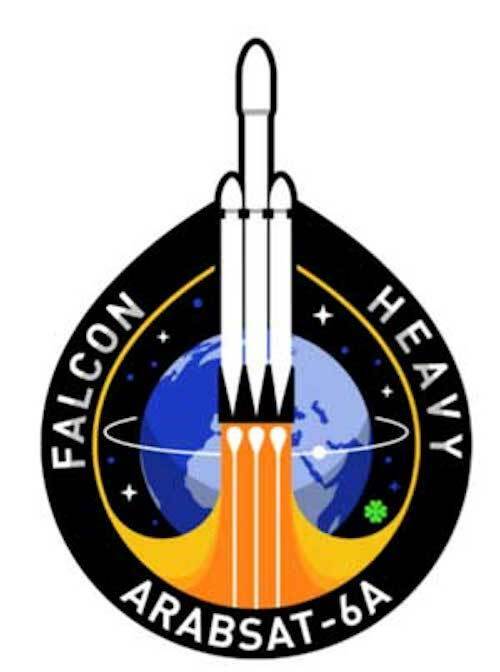 Likely a subtle nod to close observers and fans, the inclusion of Falcon Heavy is a perfect bit of foreshadowing for the next launch set to occur from Pad 39A after Crew Dragon’s flawless orbital debut. 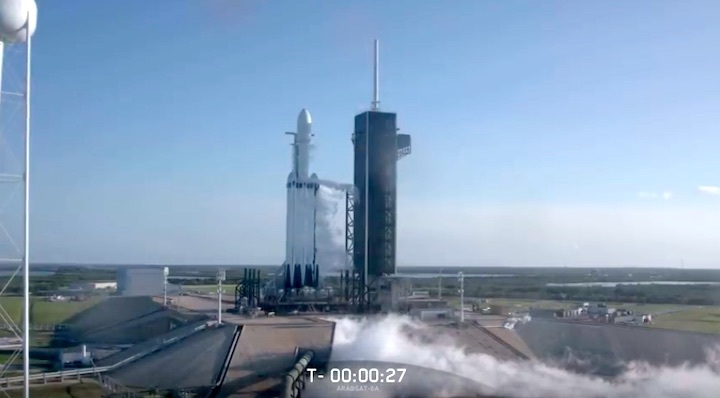 As of now, Falcon Heavy Flight 2 is settling in on a potential launch as early as the first week of April, although delays during the rocket’s critical preflight processing and static fire test are about as likely as they were during the vehicle’s inaugural mission. 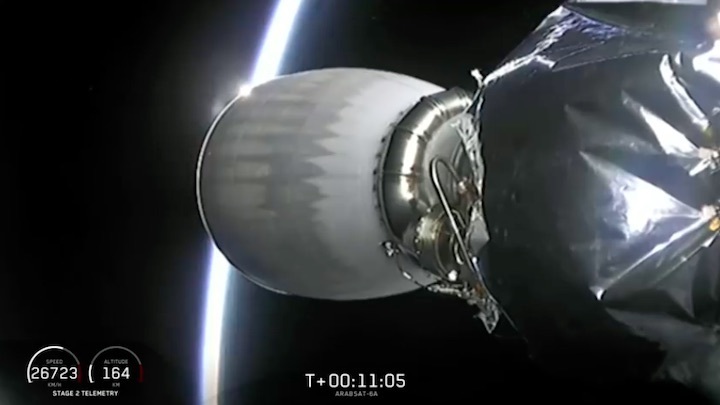 If the rocket’s first launch and booster recoveries are fully successful, both side boosters (and perhaps the center core) could fly for a second time as few as two months later in June 2019. A number of photos taken by Instagram users visiting Kennedy Space Center appear to indicate that SpaceX has more or less completed the reconfiguration of Pad 39A’s transporter/erector (T/E), modifying the base with additional hold-down clamps to account for three Falcon boosters instead of the usual one. Ten days after the successful launch of Falcon 9 B1051 in support of Crew Dragon’s first mission to orbit, it’s likely that additional work remains to ensure that 39A is fully refurbished and reconfigured for Falcon Heavy. For the heavy-lift rocket’s commercial debut and second flight ever, SpaceX is likely to be exceptionally cautious and methodical in their preflight preparations. 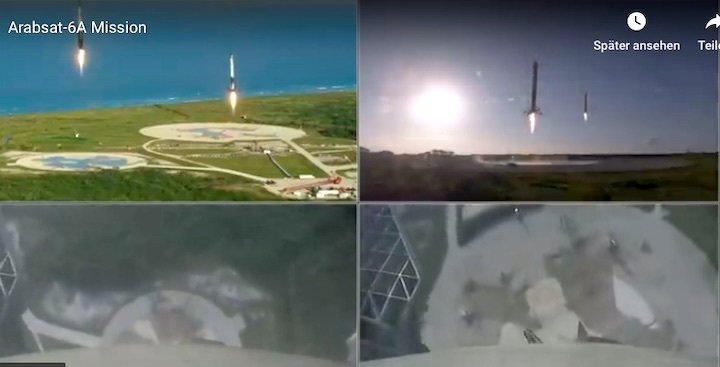 This is especially necessary due to the fact that Falcon Heavy Flight 2 differs dramatically from Falcon Heavy’s demo configuration, degrading the applicability of some aspects of the data gathered during the rocket’s largely successful test flight. Most notably, all three first stage boosters will be Block 5 variants on their first flights, whereas Flight 1’s first stage featured two flight-proven Block 2 boosters (B1023 and B1025) and one new Block 3 booster (B1033). 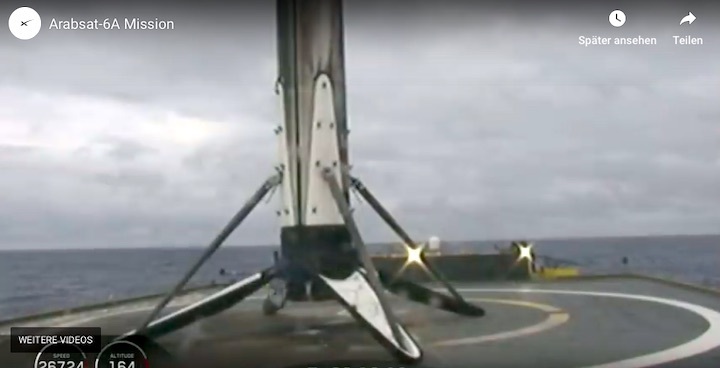 Additionally, the center core – B1033 – was lost during a landing anomaly that prevented the booster from reigniting its engine for a landing burn, cutting off another valuable source of data that would have served to better inform engineers on the performance of Falcon Heavy’s complex and previously unproven mechanical stage separation mechanisms. Falcon 9 Block 5 is a fairly radical departure from the Block 2 and 3 variants SpaceX based Falcon Heavy’s initial design on. It’s possible that the rocket’s engineers were able to at least set up that design and manufacturing work on a safe path to forward compatibility, but it’s equally possible that so much work was focused on simply getting the vehicle past its launch debut that compatibility with Falcon 9 Block 4 and 5 was pushed well into the periphery. Considering the fact that it has now been more than a year since Falcon Heavy’s February 6th, 2018 debut, the latter eventuality offers a much better fit. Nevertheless, with a solid 13-14 additional months of redesign and testing complete, it seems that SpaceX is keen to get its super heavy-lift launch vehicle back on the horse, so to speak. The specific changes made in Falcon 9 Block 4 is unclear aside from a general improvement in Merlin 1D and MVac performance, as well as significant upgrades to Falcon 9’s upper stage, likely focused on US military and NASA requirements for long-coast capabilities on unique mission profiles. 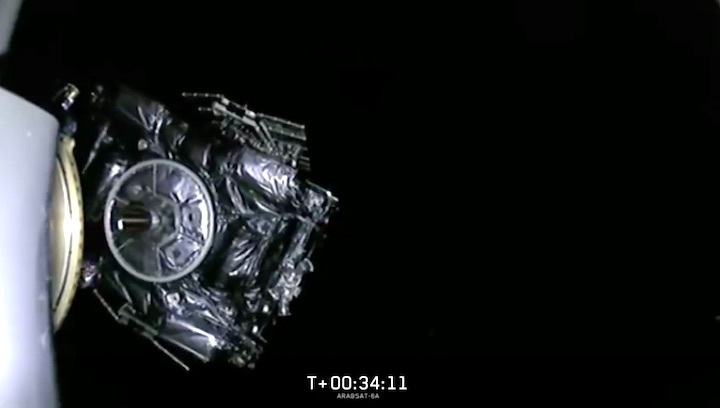 Most significantly, Falcon 9 Block 5 transitioned the SpaceX rocket to a radically different primary thrust structure (also known as the octaweb), replacing welded assemblies with bolted assemblies wherever possible. 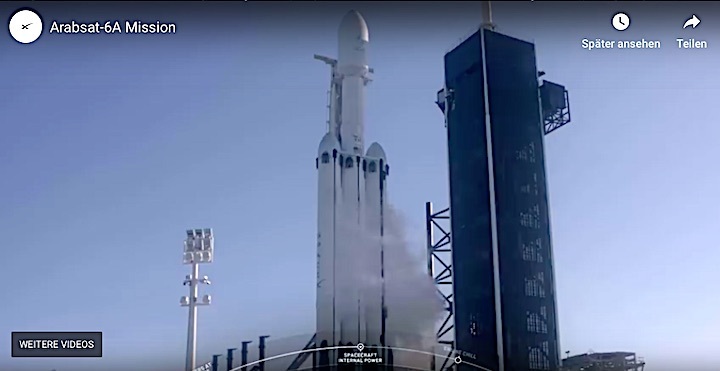 This simultaneously allows for easier repairs and modifications, improves ease of manufacture, and increases the structure’s overall strength, a critical benefit for Falcon Heavy’s heavily-stressed center core. 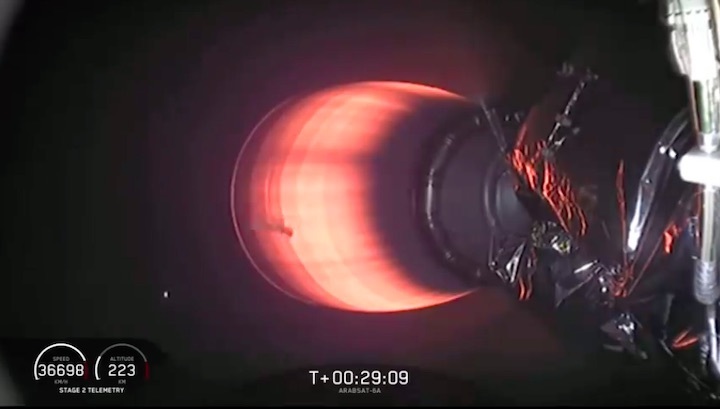 Meanwhile, Falcon 9 Block 5 moved from Full Thrust’s (Block 3/4) maximum 6800 kN (1,530,000 lbf) of thrust to more than 7600 kN (1,710,000 lbf), an increase of roughly 12%. 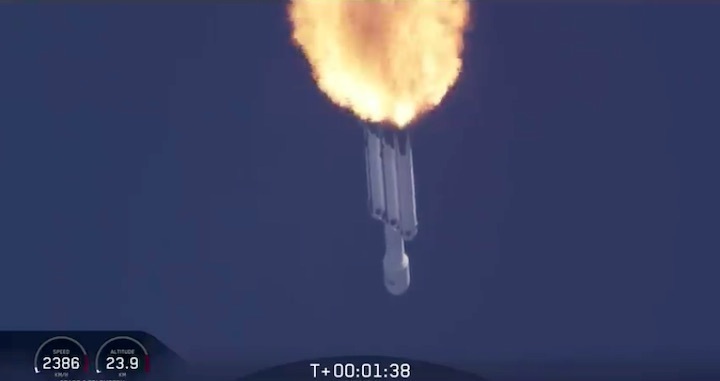 Combined with Block 5’s focus on extreme reusability, SpaceX engineers and technicians likely had to do a huge amount of work to leap from Falcon Heavy Flight 1 to Flight 2. 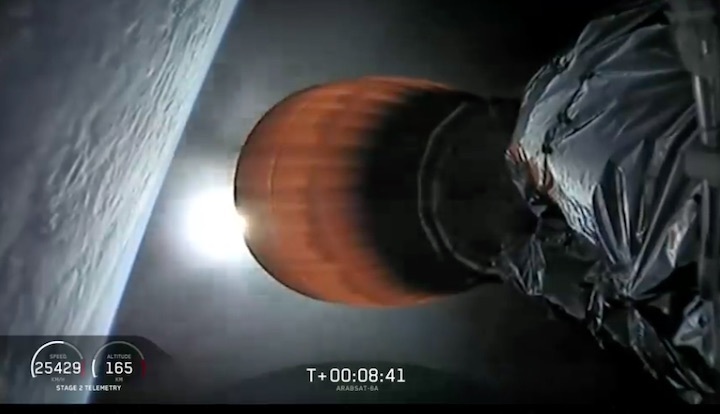 Aside from the presence of both Falcon Heavy side boosters, both of which were spotted arriving in Florida by local observers, the first Block 5 Falcon Heavy center core also very likely arrived within the last few months, followed rapidly by can be assumed to be the mission’s fairing and Falcon upper stage. 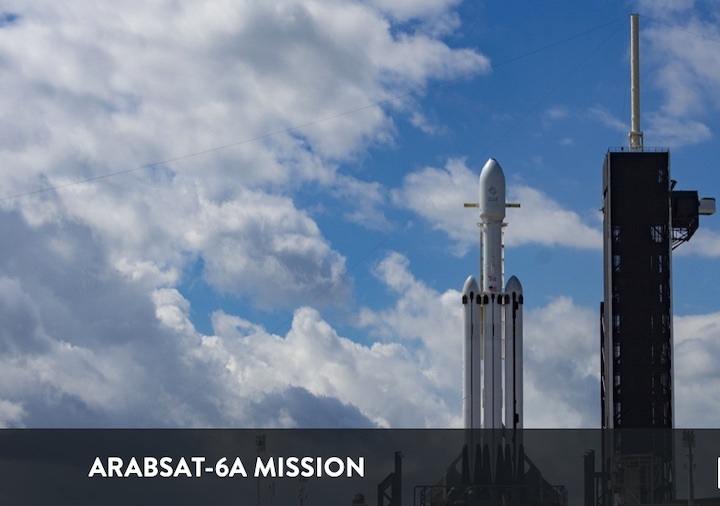 Falcon Heavy’s commercial debut will see the rocket attempt to place communications satellite Arabsat 6A – weighing around 6000 kg (13,200 lb) – into a high-energy geostationary orbit, either direct-to-GEO or a transfer (GTO) variety. 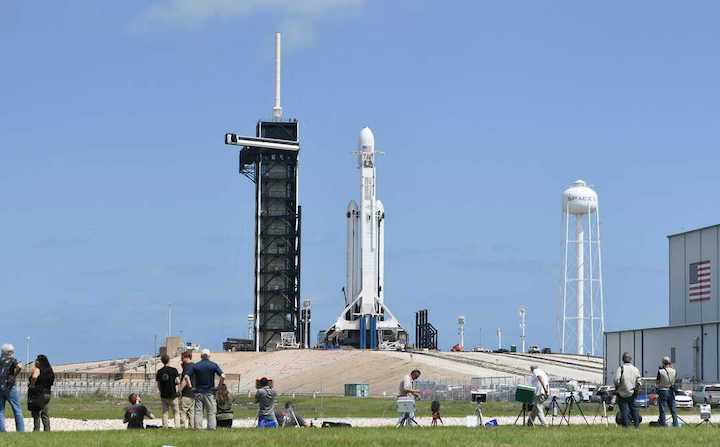 If all goes according to plan, SpaceX will attempt to turn around Falcon Heavy’s Block 5 side boosters (B1052 and B1053) for Falcon Heavy’s third launch – the USAF’s STP-2 mission – as few as 60-80 days later, June 2019. According to NASASpaceflight, STP-2 will fly with a new center core (presumed to be B1057) instead of reusing Arabsat 6A’s well-cooked B1055 booster. SpaceX's massive Falcon Heavy rocket is scheduled for its next launch no earlier than April 7 at 6:36 pm ET (22:36 UTC), people familiar with the plans told CNBC. This will be the first flight of Falcon Heavy since its nearly flawless maiden launch in February 2018. The mission, called Arabsat 6A, will launch a large communications satellite for Saudi Arabian corporation Arabsat. A SpaceX Falcon Heavy rocket lifts off from historic launch pad 39-A at the Kennedy Space Center in Cape Canaveral, Florida, U.S., February 6, 2018. 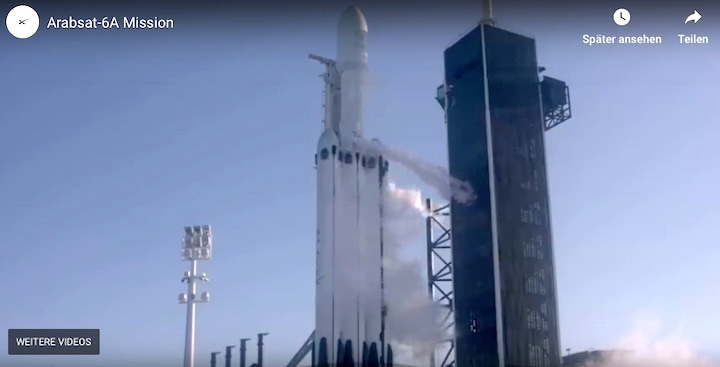 SpaceX's massive Falcon Heavy rocket is scheduled for its next launch no earlier than April 7 at 6:36 pm ET (22:36 UTC), the people said, who spoke on condition of anonymity. The mission, called Arabsat 6A, will launch a large communications satellite for Saudi Arabian corporation Arabsat. Built by Lockheed Martin, the satellite is described by Lockheed vice president Lisa Callahan as one of "the most advanced commercial communications satellites we've ever built." Arabsat 6A was previously targeting as early as the third quarter of last year but has slipped several months, one of the people noted. 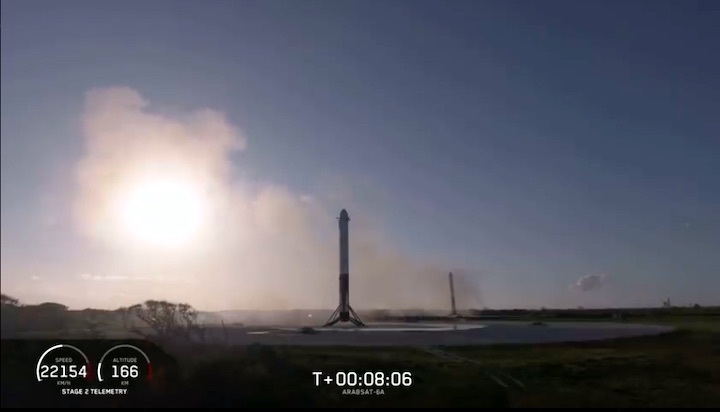 SpaceX has not conducted a test fire of the rocket on its launchpad at NASA's Kennedy Space Center, which is typically done one or two weeks before. This will be the first flight of Falcon Heavy since its nearly flawless maiden launch in February 2018. With a price tag between $90 million and $150 million per launch, Falcon Heavy has racked up a valuable manifest of future launches, even though it's only flown once. 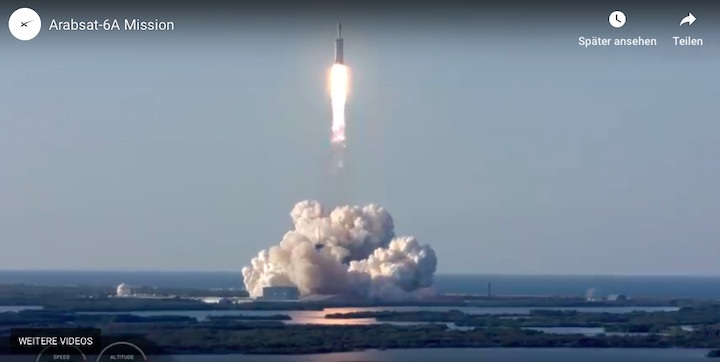 Additionally, the U.S. Air Force certified Falcon Heavy for national security launches last year, as well as gave SpaceX a $130 million contract to launch an Air Force Space Command satellite. 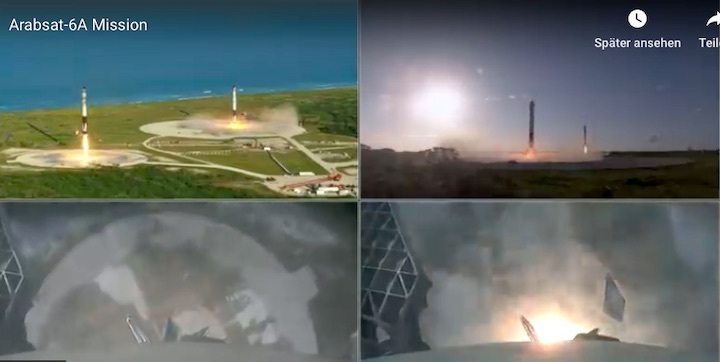 SpaceX built Falcon Heavy out of three of the company's Falcon 9 rockets — a system that has now completed dozens of successful launches over the last few years. The three cores stand side by side to create a 27-engine colossus. 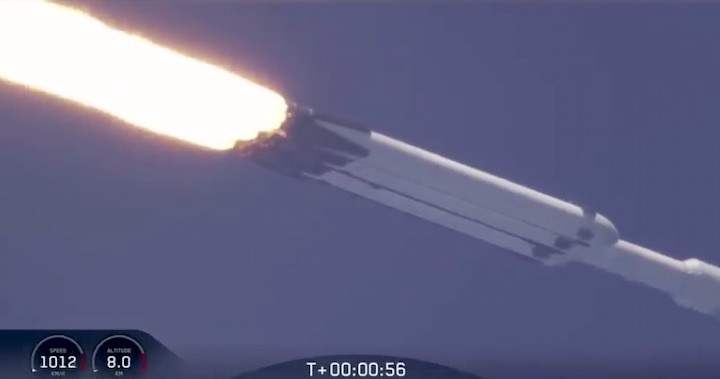 SpaceX founder and CEO Elon Muskhas said the central core needed "to be buffed up a lot" but the Falcon 9 cores on each side "use most of the same airframe." SpaceX did not immediately respond to CNBC's request for comment. Update: After a successful test fire Friday afternoon, SpaceX is targeting 6:36 p.m. Tuesday for Falcon Heavy's launch from Kennedy Space Center. 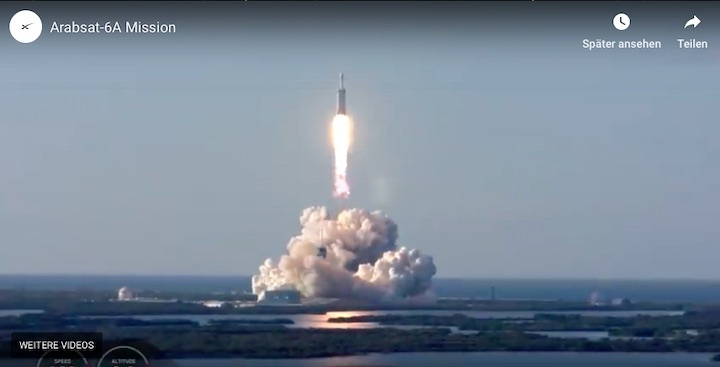 When SpaceX's three-core Falcon Heavy rocket launched on its demonstration flight in early 2018, it attracted more than 100,000 visitors to the Space Coast and garnered millions of webcast-watching fans around the globe. 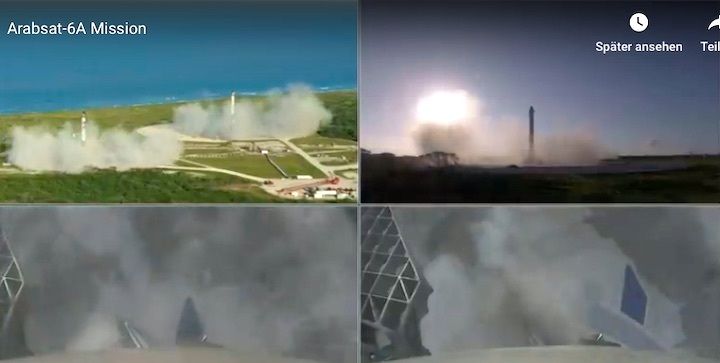 But many agreed that what came after the launch stole the show: The near-simultaneous landings of the vehicle's two side boosters at Cape Canaveral Air Force Station. 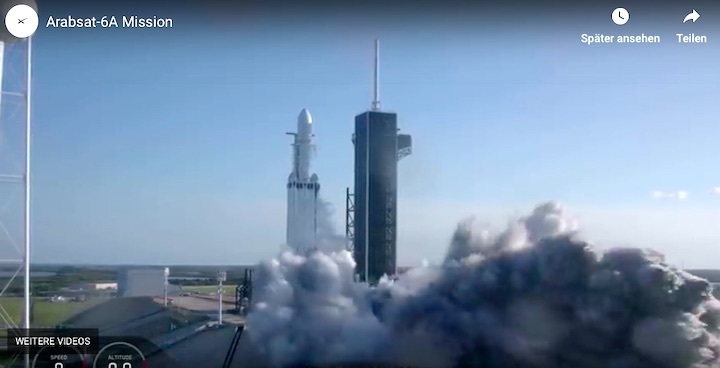 The Space Coast will see those circumstances again in the coming days when a second Falcon Heavy rocket – technically its first operational mission – launches from Kennedy Space Center's pad 39A with a commercial communications satellite for Saudi Arabia's Arabsat. Teams are targeting no earlier than 6:36 p.m. Sunday for liftoff, though that's dependent on a test firing of the rocket's 27 Merlin main engines, which was scheduled for Thursday evening. The rocket was raised to its vertical position at pad 39A early Thursday, but a test slip to Friday could mean the launch itself pushes to Monday. A SpaceX Falcon Heavy rocket sits upright on Pad 39A at Kennedy Space Center Thursday evening. Preparations continue toward a launch of the rocket no earlier than Sunday. SpaceX will only confirm an exact launch date after a successful test fire. As of Thursday afternoon, the Air Force's 45th Weather Squadron had not yet released a weather forecast, which is typically released three days before a launch. 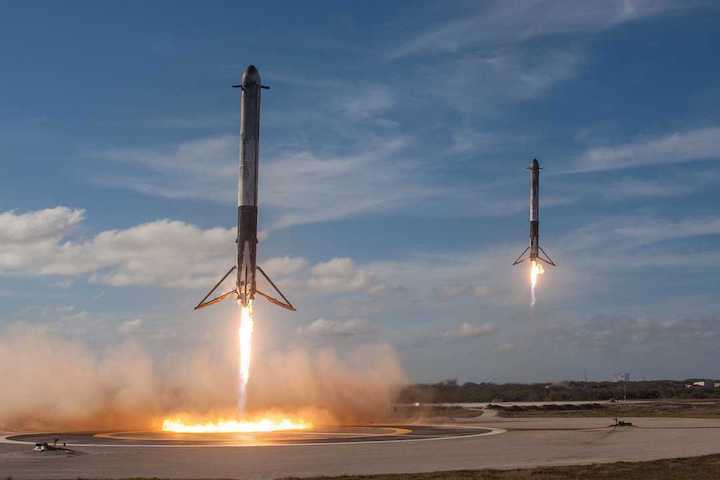 After the first launch of SpaceX's Falcon Heavy rocket on Feb. 6, 2018, the rocket's two side boosters returned to Cape Canaveral Air Force Station for tandem landings. 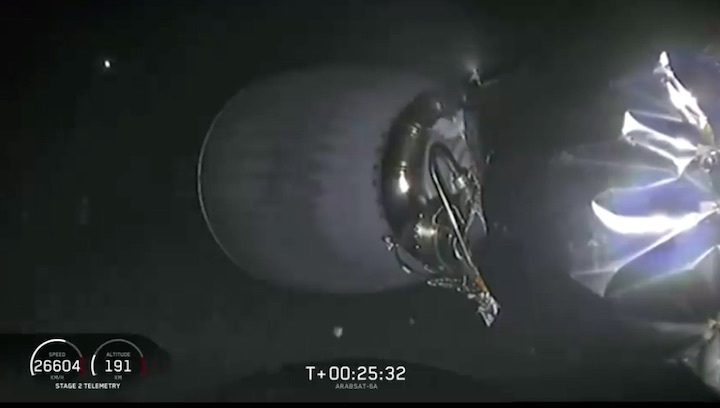 SpaceX's marine fleet, meanwhile, executed staggered departures from Port Canaveral this week and sailed toward a zone deep in the Atlantic Ocean that will host the center core's booster landing. 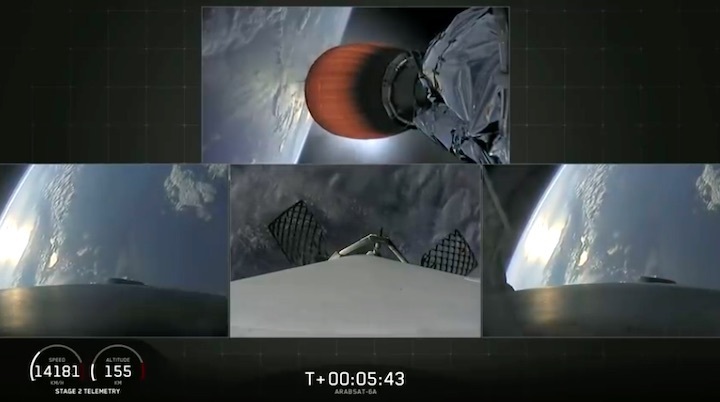 After liftoff, Falcon Heavy's two side boosters detach and automatically return to land, but the center core fires a short while longer before separating from the second stage and landing on the Of Course I Still Love You drone ship stationed hundreds of miles off the Florida coast. The ship landings are necessary due to fuel and performance requirements. 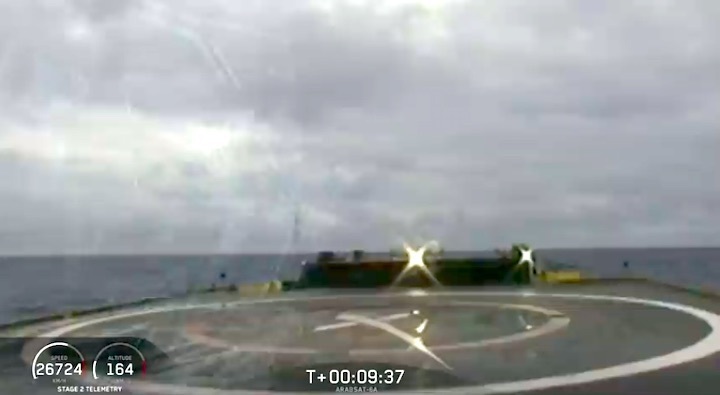 As of Wednesday, the drone ship was about halfway to the booster's landing zone, according to enthusiast ship tracker spacexfleet.com. SpaceX's drone ships also need support craft, which have departed Port Canaveral en route to the landing zone. The ships typically return to port with the booster a few days after launch. Visitors and residents should be prepared for traffic congestion across the northern parts of Brevard County, especially around the spaceport and Playalinda Beach. • KSC police will enforce an expanded boundary around the spaceport. Only employees and visitors with tickets pre-purchased through the KSC Visitor Complex will be allowed through. The Visitor Complex will be open during its normal hours from 9 a.m. to 7 p.m., but will extend closing time depending on when liftoff occurs. • The expanded boundary will apply at KSC's main artery, the NASA Causeway, on State Road 405. State Road 3 just south of KSC will also be closed, meaning Space Commerce Way will be inaccessible. Only Exploration Park-related employees, such as those at Blue Origin, will be allowed through. • The Max Brewer Causeway on State Road 406 in Titusville will also see restricted access to manage traffic that enters the Canaveral National Seashore. Playalinda Beach will be open until capacity is reached or 5:30 p.m., whichever comes first. • State Road 3 at U.S. 1 in Volusia County will remain open with access to the beach until 5:30 p.m. or full capacity, whichever comes first. 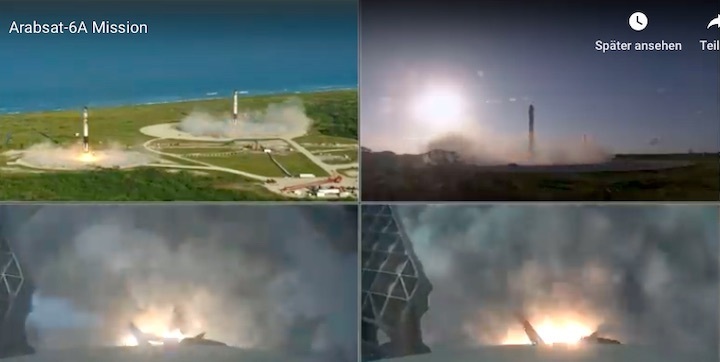 Twenty-seven of SpaceX's Merlin main engines roared to life at Kennedy Space Center Friday, paving the way for launch of a three-core Falcon Heavy rocket and commercial communications satellite as soon as Tuesday. The 12 p.m. test gave SpaceX teams enough data to choose Tuesday as a new launch date with 6:36 p.m. as the target liftoff time. The launch window, if needed, will extend until 8:35 p.m. The Air Force's 45th Weather Squadron is expecting a 30 percent probability of favorable weather conditions Tuesday, but the forecast improves to 80 percent “go” on Wednesday. This mission, known as Arabsat 6A, will take a large, heavy communications satellite built by Lockheed Martin to orbit from pad 39A. 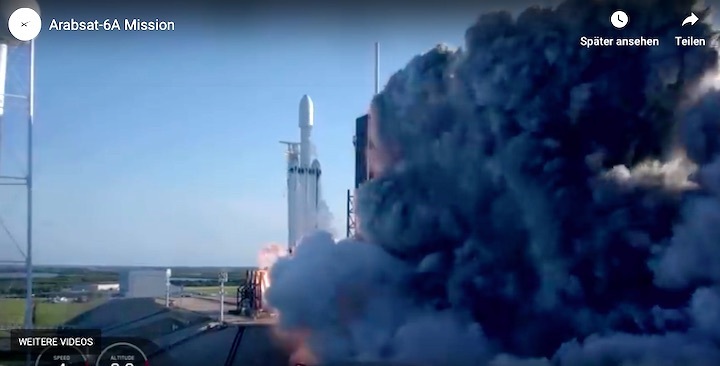 It marks Falcon Heavy's first operational mission since the demonstration flight last year that captured minds around the world with the Tesla Roadster and "Starman" mannequin. 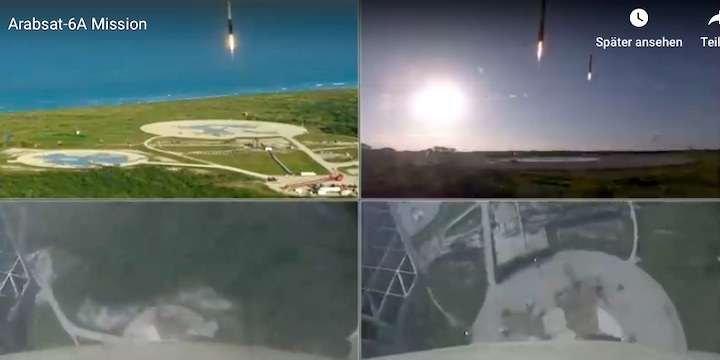 Shortly after liftoff, Falcon Heavy's two side boosters will perform an aerial ballet, flip around and return to Cape Canaveral Air Force Station's Landing Zone 1 for tandem landings. The sonic boom-producing landings are typically visible to the public, especially from locations like Port Canaveral and the beaches. The center core, meanwhile, will burn slightly longer to boost the spacecraft farther, then separate from the second stage and target a landing on the Of Course I Still Love You drone ship stationed in the Atlantic Ocean. The booster should return to Port Canaveral a few days later. Traffic patterns around the spaceport will be changed on launch day to deal with increased traffic, meaning only employees and previous launch-related ticket holders will be able to access the area, including the KSC Visitor Complex. The main entrance on State Road 405 to KSC, State Road 3 on the south end, and State Road 3 on the north end will all be staffed by KSC police and Brevard County Sheriff's Office deputies. Access to the Canaveral National Seashore will be granted until capacity is reached or until 5:30 p.m., whichever comes first. Join floridatoday.com/space for countdown updates and chat starting at 4:30 p.m. Tuesday, including streaming of SpaceX’s launch webcast about 30 minutes before liftoff. Fourteen months since its triumphant maiden voyage, the 27 engines of SpaceX’s mighty Falcon Heavy came to life again today (April 5) for a standard launch practice countdown (dress rehearsal) and Static Test Fire, which now paves way for the beast to soar again as soon as April 9, as it takes flight with its first commercial client. 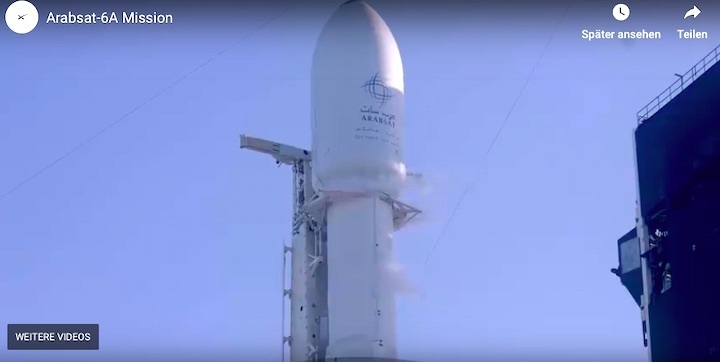 Liftoff is scheduled to occur from historic Pad 39A at Florida’s Kennedy Space Center (KSC) during a two-hour “window”, which extends from 6:36 p.m. through 8:33 p.m. EDT, carrying the giant Arabsat 6A communications satellite and deploying it into geostationary orbit at 30.5 degrees East longitude to provide television, internet, telephone and secure communications services to customers throughout the Middle East, Africa and parts of Europe. Contracts to build Arabsat 6A were signed back in April 2015, between prime contractor Lockheed Martin and Riyadh-headquartered Arabsat and King Abdulaziz City for Science and Technology (KACST). 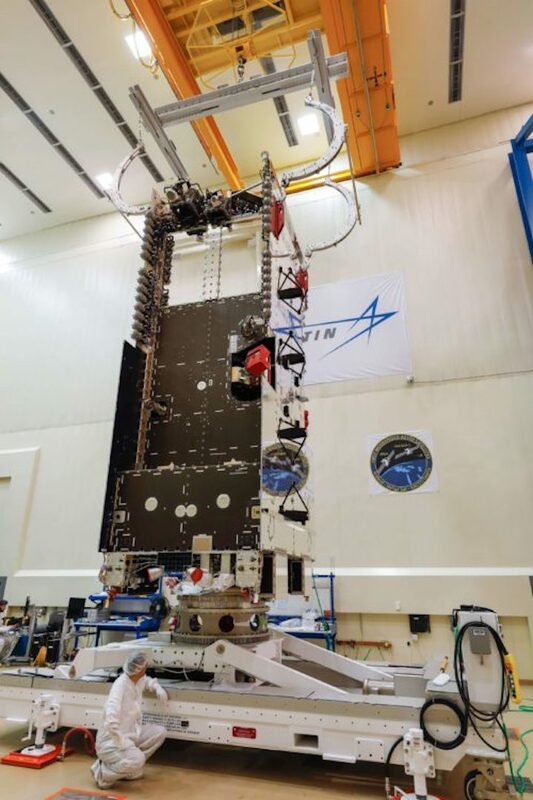 Under the terms of the contract, two satellites—Arabsat 6A and HellasSat-4/SaudiGeoSat-1 (HS4/SGS1)—would be fabricated atop a modernized variant of Lockheed Martin’s tried-and-true A2100 spacecraft bus. Additionally, the contract initiated a joint venture to explore the design, manufacturing, assembly and integration of future satellites within the Kingdom of Saudi Arabia itself. Both satellites were built at Lockheed Martin’s Denver, Colo., facility, and represent the most advanced commercial satellites ever built by the firm. In addition to an 18-year-plus “fuel-life”, the modernized A2100 boasts a hybrid electrical/liquid propulsion system—with Hall current thrusters and liquid apogee engine—to enable greater efficiency, as well as upgraded flight software and two lithium-ion batteries. Its flexible solar arrays are 30 percent lighter and 50 percent more powerful than earlier incarnations, providing in excess of 20 kilowatts and supporting a 16-kilowatt payload. Arabsat 6A is laden with eight communications system antennas, supporting 23 fixed Ka-band spot beams and a steerable Ka-band spot beam. In September 2015, Lockheed Martin announced that HS4/SGS1 would benefit from highly agile payload technology, affording them flexible bandwidth and frequency management for secure communications, including the ability to dynamically reprogram on-orbit assets and make rapid adjustments to communications networks. 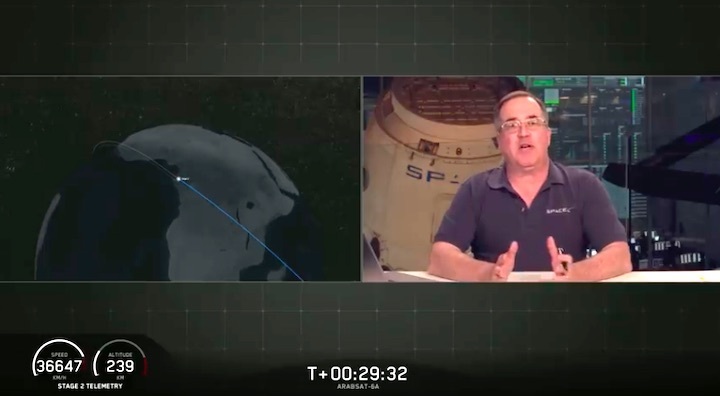 “Our goal is to build a smarter satellite that routes capacity where you need it, when you need it,” explained Carl Marchetto, current vice president and general manager of commercial space at Lockheed Martin. “And with this technology now available on the modernized A2100 family, it will truly meet customer demand for increased flexibility.” It is expected that satellites outfitted with this flexible technology will be able to maximize revenue generation by dynamically shifting bandwidth to peak-demand areas. 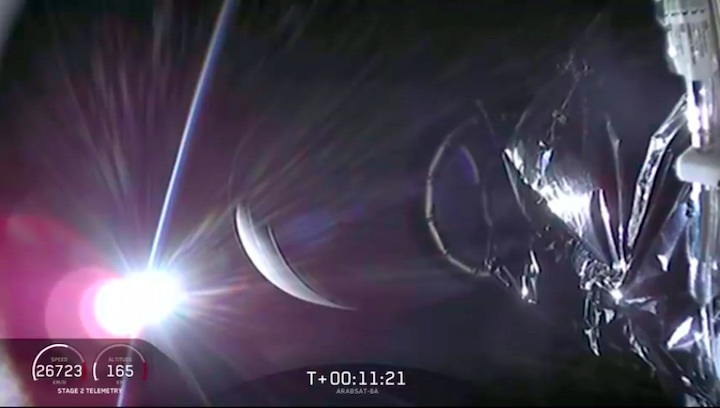 Although HS4/SGS1 is equipped with this advanced beam-forming/hopping technology, Lockheed Martin’s Chris Pettigrew advised AmericaSpace that it is not aboard Arabsat 6A. All told, the firm currently has five orders for modernized A2100s on its books, with JCSat-17—currently undergoing final integration, ahead of an Ariane 5 launch later in 2019—and the next members of the Space-Based Infrared System (SBIRS 5 and 6) also based on this satellite architecture. By May 2016, satellite and subsystem development for both Arabsat 6A and HS4/SGS1 passed smoothly through Critical Design Review (CDR), ensuring that designs were fully in-step with technical specifications, and the program was green-lighted to enter its build, integration and testing phase. By this point, according to Mr. Marchetto, Lockheed Martin had already begun to fabricate the satellites’ antenna reflectors, solar array panels and core structure. Final integration of HS4/SGS1 was completed in August 2017 and the satellite was delivered to Lockheed Martin’s facility in Sunnyvale, Calif., three months later. Meanwhile, in February 2018, Arabsat 6A assembly ended and it too was transported to Sunnyvale for testing. This punishing regime subjected both satellites to blasts of extreme sound, heat and cold and near-total vacuum, to evaluate their performance under the kind of stresses they will experience during launch, ascent and whilst on-orbit. Two months ago, a European Ariane 5 booster successfully launched HS4/SGS1, where it is currently wrapping up its on-orbit testing phase, ahead of integration into the operational Arabsat network. 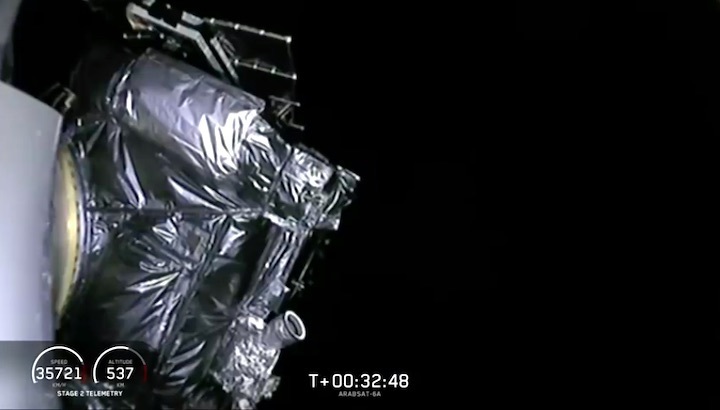 In the meantime, Arabsat 6A was transported by road from Sunnyvale to Cape Canaveral in January 2019 to begin final processing for launch. 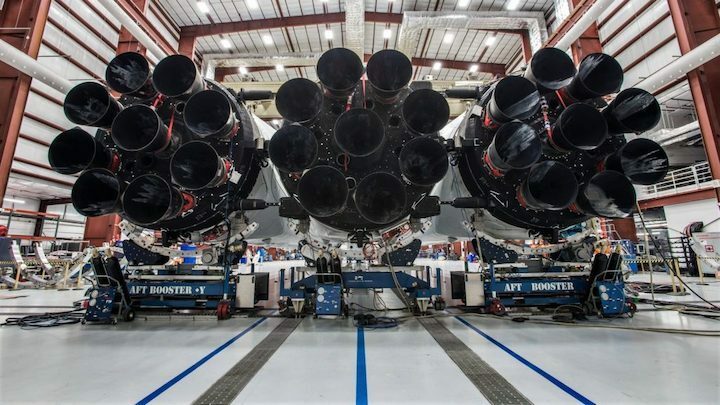 It has been a long 14 months since the world last heard the roar of over 5 million pounds of thrust from the 27 Merlin 1D+ engines of the Falcon Heavy’s core and side-mounted boosters, and this time, the triple-barreled machine is sporting all shiny brand new Block 5 cores. And SpaceX hopes to refly the side boosters on the next Falcon Heavy too, which is currently scheduled to launch this summer with the U.S. Air Force STP-2 mission. Assuming they land of course next week. 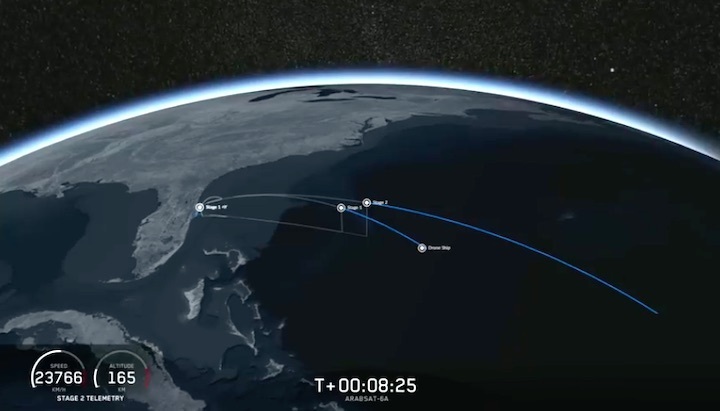 Earlier this week, the East Coast-based Autonomous Spaceport Drone Ship (ASDS)—nicknamed “Of Course I Still Love You”—was drawn out to sea, reportedly some 600 miles (967 km) downrange of the launch site, to await the oceanic recovery of the core stage. 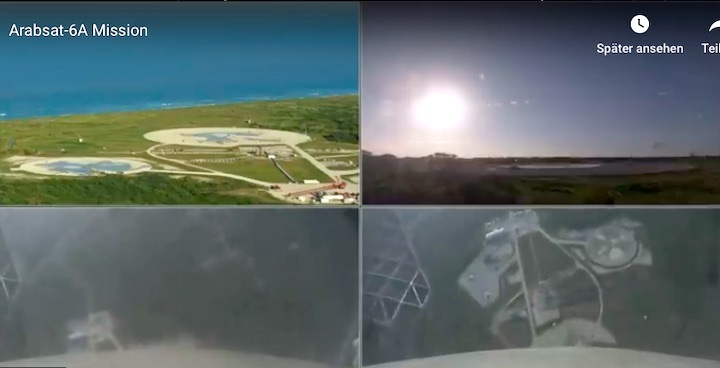 The twin side boosters, meanwhile, are planned to perform Return to Launch Site (RTLS) touchdowns on Landing Zones (LZ) 1 and 2, same as last February’s Falcon Heavy debut. With test fire now complete, the rocket will be lowered to horizontal and rolled back into its nearby processing hangar to receive its payload, before rolling out again next week for its first launch attempt. If you plan on visiting the Cape to witness the launch, be aware of new rules and road closures that will be in place ahead of the 100,000+ people expected to descend on the area to see the launch; do your homework (we will publish a story on this very soon anyway, so stay tuned). As the Falcon Heavy readies for its second mission, attention was drawn earlier this week to the usefulness of the giant rocket—paired, intriguingly, with a Boeing-built Interim Cryogenic Propulsion Stage (ICPS)—to achieve NASA’s new goal of achieving boots on the Moon by 2024. At a town hall meeting of agency employees at NASA Headquarters on 1 April, NASA Administrator Jim Bridenstine identified the Falcon Heavy and an ICPS as one potentially realistic option of delivering an Orion spacecraft and European Service Module (ESM) to lunar orbit. In his remarks, Mr. Bridenstine stressed a number of difficulties associated with elevating the heavyweight stack from horizontal to vertical, via the Transporter-Erector (TE), as well as the need for pad modifications to handle vertical hypergolic loading. Update: SpaceX is now targeting Wednesday at 6:36 p.m. for the launch of Falcon Heavy. Weather will be 80 percent "go" during the window that closes at 8:35 p.m. The weather forecast continues to look less than favorable for the launch of SpaceX's Falcon Heavy rocket on its first operational mission Tuesday, according to the Air Force. Conditions are only 30 percent "go" for the 6:36 p.m. launch from Kennedy Space Center's pad 39A with the Arabsat 6A commercial communications satellite. Teams can, however, try to wait out the weather until the window closes at 8:35 p.m.
"The primary weather concerns are disturbed weather, anvil cloud, cumulus cloud and lightning rules," forecasters with the 45th Weather Squadron said Sunday. In the event of a delay to Wednesday, the forecast improves to 80 percent "go." 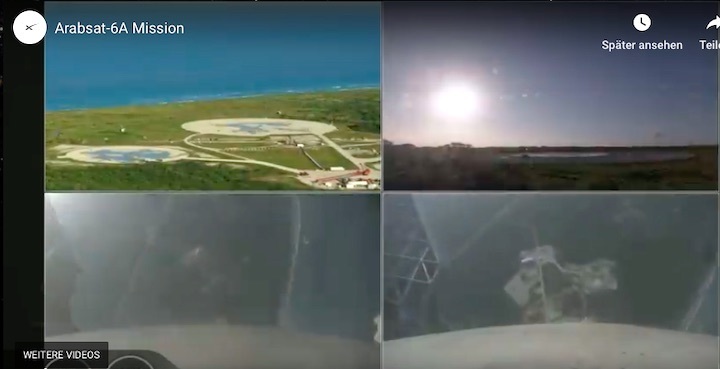 After liftoff, the rocket's three cores will all target landings – the two side boosters will autonomously return to Cape Canaveral Air Force Station, while the center core will fire slightly longer and then land on the Of Course I Still Love You drone ship in the Atlantic Ocean. The dual landings will likely be the only ones visible from the Space Coast, but the center core will return to Port Canaveral for processing a few days later. 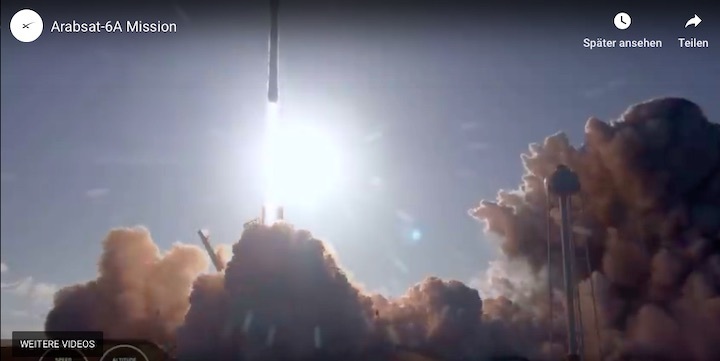 Tuesday's launch attempt will mark Falcon Heavy's first operational flight since February 2018's demonstration launch that vaulted a Tesla Roadster and "Starman" mannequin to deep space. They're expected to coast through the solar system for millions of years. 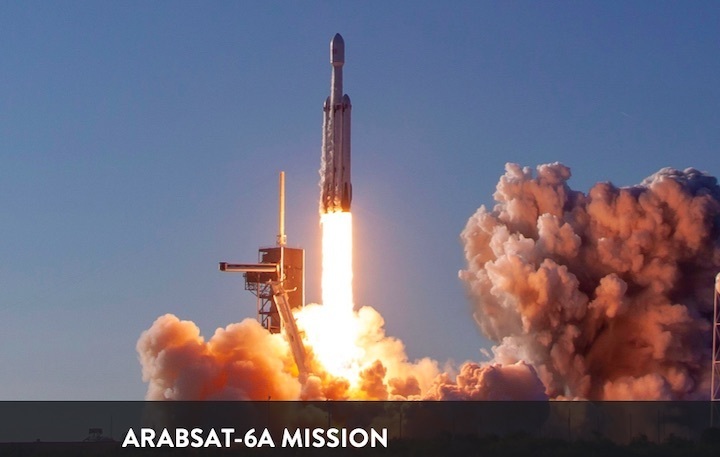 SpaceX is targeting Thursday, April 11 for a Falcon Heavy launch of the Arabsat-6A satellite from Launch Complex 39A (LC-39A) at NASA’s Kennedy Space Center in Florida. The launch window opens at 6:35 p.m. EDT, or 22:35 UTC, and closes at 8:31 p.m. EDT, or 00:31 UTC on Friday, April 12. 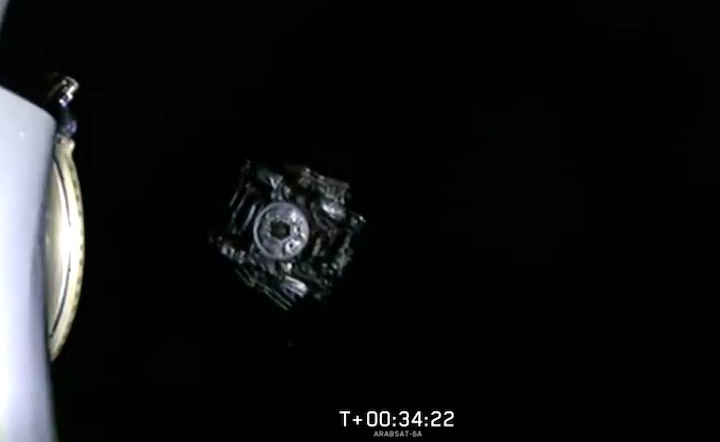 The satellite will be deployed approximately 34 minutes after liftoff. SpaceX plans to try again Thursday evening to launch the world’s most powerful rocket from Kennedy Space Center. 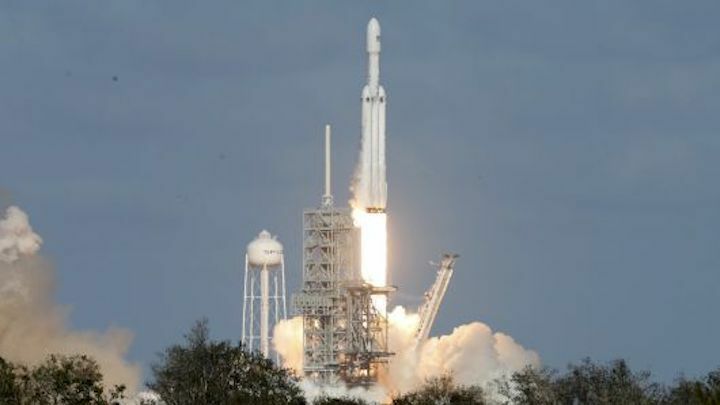 Big crowds hoping to see the Falcon Heavy blast off Wednesday were disappointed when strong high-altitude winds that could have blown the rocket off course halted the mission's first countdown. Liftoff from pad 39A is targeted for 6:35 p.m., at the opening of a nearly two-hour window. The weather forecast is 90 percent "go." 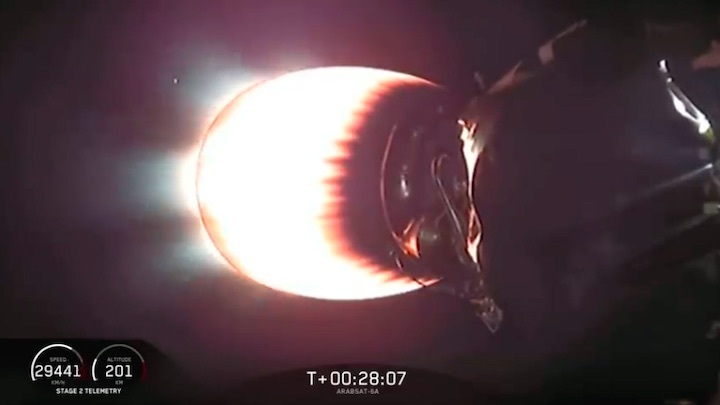 Generating more than 5 million pounds of thrust from 27 main engines powering three first-stage boosters, the Falcon Heavy is more than twice as powerful as the next biggest U.S. rocket. A demonstration mission in early 2018 drove Elon Musk’s Tesla Roadster into an orbit reaching as far as Mars. This time, the rocket aims to lift the more than 14,000-pound Arabsat 6A communications satellite to space. Minutes after the launch, SpaceX will try to land the rocket's side boosters on pads at Cape Canaveral Air Force Station. Prepare for sonic booms. 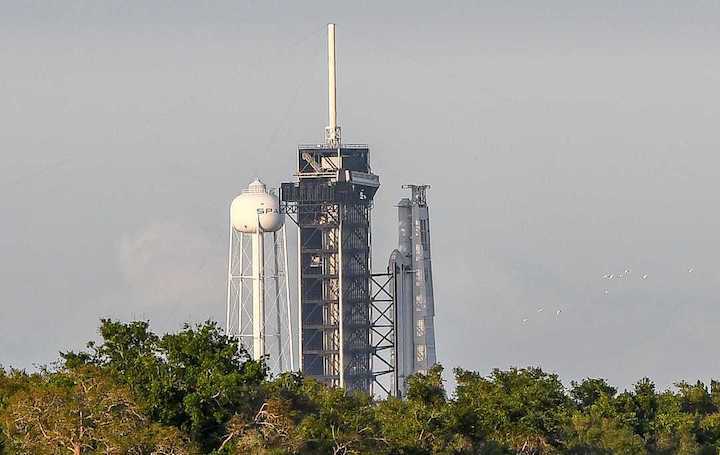 SpaceX's Falcon Heavy rocket stands ready at Kennedy Space Center's pad 39A ahead of the Arabsat 6A mission on Wednesday, April 10, 2019. Join floridatoday.com/space for countdown updates and chat starting at 4:30 p.m. Thursday, including streaming of SpaceX’s launch webcast about 20 minutes before liftoff. 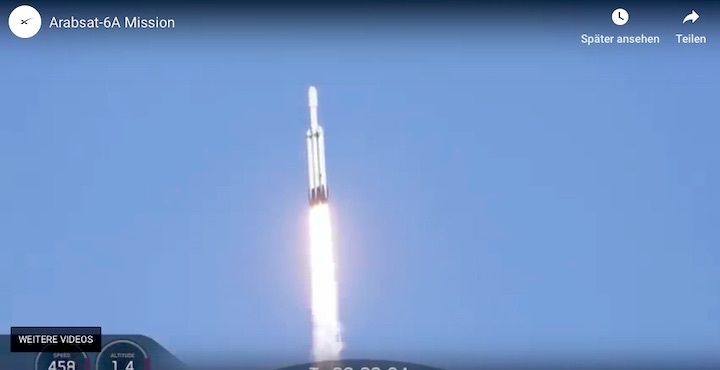 Just an hour before Florida sunset, SpaceX’s gigantic Falcon Heavy—lauded by the Hawthorne, Calif.-headquartered launch services provider as the world’s most powerful active rocket, by a factor of two—successfully roared aloft tonight (Thursday, 11 April) from Pad 39A at the Kennedy Space Center (KSC) for its long-awaited first commercial mission. 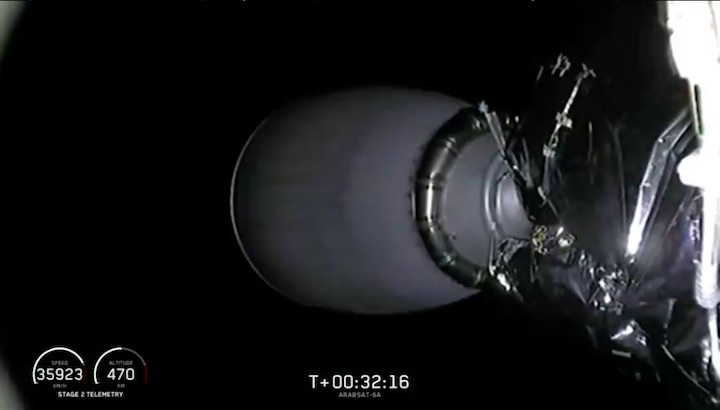 Fourteen months after a triumphant test flight, which boosted SpaceX CEO Elon Musk’s cherry-red Tesla Roadster onto a Mars-crossing heliocentric trajectory, the triple-cored booster got down to business by delivering the 14,320-pound (6,495 kg) Arabsat 6A communications satellite to orbit on behalf of Riyadh-headquartered Arabsat and King Abdulaziz City for Science and Technology (KACST). 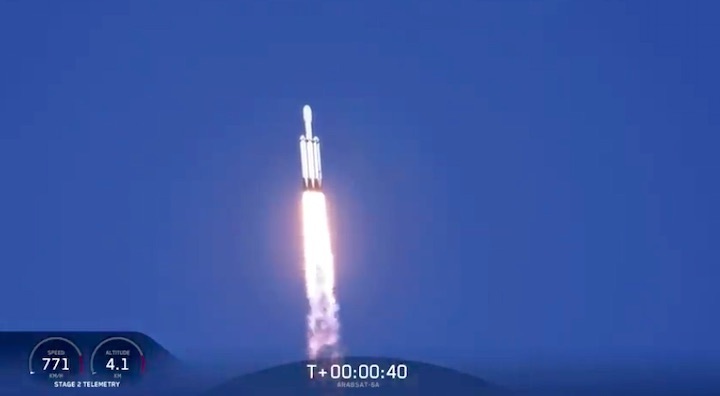 Under the combined thrust of 5.1 million pounds (2.3 million kg), the Falcon Heavy performed with perfection during first-stage flight, before the side boosters plunged back to Earth and alighted smoothly like a pair of synchronized ballet dancers at Landing Zones (LZ)-1 and 2 at the Cape. 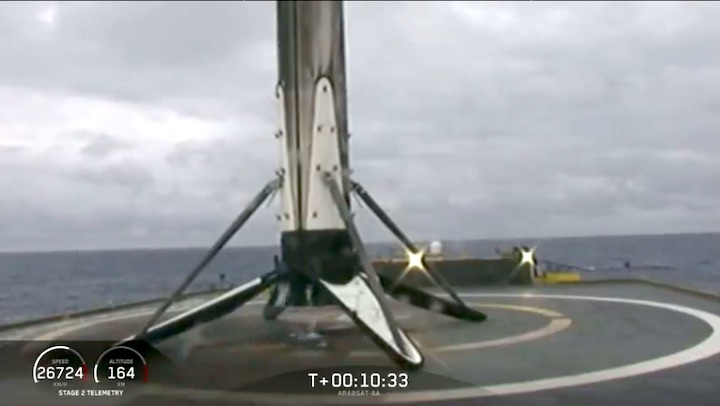 Meanwhile, despite “challenging” conditions at sea, the core booster successfully touched down on the Autonomous Spaceport Drone Ship (ASDS) in the Atlantic Ocean, completing an objective left unfulfilled during last year’s Falcon Heavy test flight. 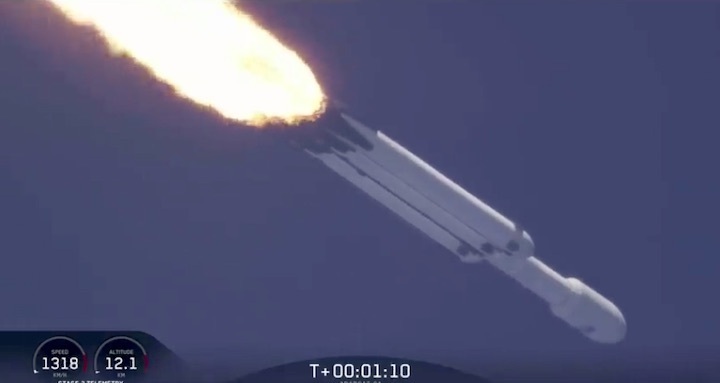 All three boosters were previously unflown, although the side rockets are expected to be reused on the Falcon Heavy’s next mission in the summer.